RE: KING AND SPANISH MACKEREL – RETENTION OF RECREATIONAL BAG LIMITS OF KING AND SPANISH MACKEREL BY COMMERCIALLY-PERMITTED VESSELS WHILE ON A PRIVATE RECREATIONAL TRIP. This proclamation revises FF-21-2017 dated May 15, 2017. It reflects changes to the King and Spanish Mackerel fisheries in accordance with Framework Amendment 5 to the Fishery Management Plan for Coastal Migratory Pelagics in the Gulf of Mexico and Atlantic Regions. Additions to Section IV (General Information) notify permit holders that vessels with a valid Federal Commercial King Mackerel Permit or Spanish Mackerel Permit are no longer prohibited from fishing for or retaining the recreational bag limits of king and Spanish mackerel only when the vessel is on a private recreational fishing trip and the commercial harvest of king or Spanish mackerel is closed. This proclamation does not modify the prohibition on sale of fish caught under the recreational bag limit in Sections I and II below and referenced in Section IV.C. A. It is unlawful to sell or offer for sale Spanish Mackerel harvested in or from the Exclusive Economic Zone (EEZ) in a commercial fishing operation without a valid Federal Commercial Spanish Mackerel Permit. B. It is unlawful for charter vessels or headboats with both a valid Federal Atlantic Charter/Headboat Coastal Migratory Pelagics Permit and a valid Federal Commercial Spanish Mackerel Permit to sell or offer for sale Spanish Mackerel harvested in or from the EEZ when fishing with more than three persons (including captain and mate) onboard. C. It is unlawful to purchase Spanish Mackerel harvested from the Atlantic Ocean without a valid Federal Gulf and South Atlantic Dealer Permit. D. It is unlawful to purchase Spanish Mackerel harvested in or from the EEZ from a vessel that does not have a valid Federal Commercial Spanish Mackerel Permit. A. It is unlawful to sell or offer for sale King Mackerel harvested by hook-and-line in a commercial fishing operation without a valid Federal Commercial King Mackerel Permit. B. It is unlawful for charter vessels or headboats with both a valid Federal Atlantic Charter/Headboat Coastal Migratory Pelagics Permit and a valid Federal Commercial King Mackerel Permit to sell or offer for sale King Mackerel harvested when fishing with more than three persons (including captain and mate) onboard. 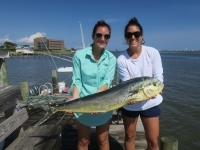 C. It is unlawful to sell or offer for sale King Mackerel harvested or possessed under the recreational bag limits unless the vessel owner has been issued a valid Federal Commercial King Mackerel Permit. D. It is unlawful to sell or offer for sale King Mackerel taken with gill nets in the Atlantic Ocean south of Cape Lookout (34° 37.3000’ N. lat), except in accordance with II. F. listed below. E. It is unlawful to purchase King Mackerel harvested from the Atlantic Ocean by hook-and-line from a vessel that does not have a valid Federal Commercial King Mackerel Permit. F. It is unlawful for vessels with both a valid Federal Commercial Directed Shark Permit and a valid Federal King Mackerel Permit, when engaged in directed shark fishing with gill nets south of Cape Lookout (34° 37.3000’ N. lat), to possess and sell more than three (3) King Mackerel per crew member. A. King and Spanish Mackerel harvested as part of a permitted recreational fishing tournament may be sold in accordance with N.C.G.S. 113-168.4(c) and N.C. Marine Fisheries Commission rule 15A NCAC 03O .0102. A. This proclamation is issued under the authority of N.C.G. S. 113-170.4; 113-170.5; 113-182; 113-221.1; 143B-289.52 and N.C. Marine Fisheries Commission Rules 15A NCAC 03H .0103, 03M .0301 and 03M .0512. F. The provisions of N.C. Marine Fisheries Commission Rule 15A NCAC 03M .0301 remain in effect. G. Vessels holding both a valid National Marine Fisheries Service Atlantic Charter/Headboat Coastal Migratory Pelagics Permit and either a valid National Marine Fisheries Service Commercial Spanish Mackerel Permit OR Commercial King Mackerel Permit are considered to be operating as a charter boat/headboat when fishing with more than three persons (including captain and mate) onboard (see 50 CFR § 622.2). H. Provisions for individuals onboard a charter or headboat to possess multiple daily bag limits may be found at 50 CFR §622.382(2) and state that a person who is on a trip that spans more than 24 hours may possess no more than two daily bag limits, provided such trip is on a vessel that is operating as a charter vessel or headboat, the vessel has two licensed operators aboard, and each passenger is issued and has in possession a receipt issued on behalf of the vessel that verifies the length of the trip. I. The federal Exclusive Economic Zone (EEZ) is defined as waters of the Atlantic Ocean from three to 200 miles seaward of the shoreline. J. In accordance with N.C. General Statute 113-221.1(c) all persons who may be affected by proclamations issued by theFisheries Director are under a duty to keep themselves informed of current proclamations. K. Contact N.C. Division of Marine Fisheries, P.O. Box 769, Morehead City, NC 28557; 252-726-7021 or 800-682-2632 for more information or visit the division website at www.ncmarinefisheries.net. L. This proclamation revises FF-21-2017 dated May 15, 2017. It reflects changes to the King and Spanish Mackerel fisheries in accordance with Framework Amendment 5 to the Fishery Management Plan for Coastal Migratory Pelagics in the Gulf of Mexico and Atlantic Regions. Additions to Section IV (General Information) notify permit holders that vessels with a valid Federal Commercial King Mackerel Permit or Spanish Mackerel Permit are no longer prohibited from fishing for or retaining the recreational bag limits of king and Spanish mackerel only when the vessel is on a private recreational fishing trip and the commercial harvest of king or Spanish mackerel is closed. This proclamation does not modify the prohibition on sale of fish caught under the recreational bag limit in Sections I and II below and referenced in Section IV.C. Please see the following NOAA Fishery Bulletin for more information: http://sero.nmfs.noaa.gov/fishery_bulletins/2017/043/index.html.